Posted by peter88 from the Automotive category at 24 Sep 2017 08:38:33 am. Many motorists find it more difficult to drive at night than during the daytime. Drivers may fear nighttime driving because they feel their comfort levels behind the wheel are compromised when the sun goes down. Statistics show those fears are not unfounded, as a 2016 analysis of data from the U.S. Department of Transportation’s Fatality Analysis Reporting System found that 43 percent of motor vehicle crash deaths in the United States in 2014 occurred between the hours of 6 p.m. and 3 a.m. But drivers should not simply blame their nerves for the discomfort they feel when driving at night. 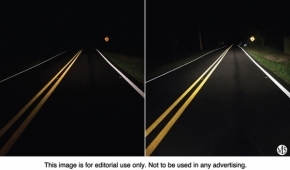 A recent study from the AAA automotive club found that the halogen headlights in more than 80 percent of the vehicles on the road today fail to safely illuminate unlit roadways, even when vehicles are moving at speeds as low as 40 miles per hour. To maintain their vehicles, many drivers take their cars and trucks in for routine oil changes and tire rotations. But headlight maintenance can go a long a way toward making drivers feel safer at night, when visual acuity of the human eye is reduced by up to 70 percent. The following are three ways drivers can improve the performance of their headlights. A recent report from the Insurance Institute for Highway Safety was critical of headlight design, painting a bleak picture for headlight performance in 30 of the 31 vehicles tested for the report. Many vehicles on the road today are equipped with standard halogen headlights that begin to break down in two to three years, potentially reducing light output by as much as 30 percent. Philips X-tremeVision Bulbs employ advanced technology that can deliver up to 100 percent more light on the road than standard halogen bulbs. Compatible with various makes and models, each bulb produces a longer beam pattern than standard halogen headlights, vastly improving nighttime visibility on even the darkest roadways. 2. Turn headlights on earlier. Another way to improve headlight performance is to start utilizing them earlier. Once manufacturer-supplied bulbs have been replaced, drivers can make a conscious effort to turn their lights on before the sky goes completely dark. Many drivers feel their vision is most compromised during twilight hours, when a setting sun and shifting shadows combine to greatly compromise driver visibility. By turning headlights on during twilight hours, drivers can counter the effects of Mother Nature during those hours when they feel most vulnerable. Drivers wouldn’t spend hours on the road driving with dirty windshields, but many are unknowingly driving with clouded headlamps that could be compromising their nighttime visibility and reducing light output by as much as 40 percent. The Philips Headlight Restoration Kit is designed to restore headlamp lens clarity to “like new” condition. Utilizing a protective UV coating that produces longer lens clarity and prevents clouding for up to two years, the kit can effectively improve lenses that turn hazy and yellow after years of exposure to sunlight, ozone, pollution and other environmental factors. Many drivers are naturally more nervous at night than during the daytime. But upgrading headlights and taking steps to maintain headlight performance can calm those nerves and make for safer nighttime driving. More information is available at www.philips.com/automotive.